Live aboard a vessel and sail to the best dive locations. Enjoy the abundant sealife beneath the surface in the Sea of Cortez. View the 300 species of reef fishes, hammerhead sharks and giant rays. Travel picture of Riding a giant manta ray. I work for Marine Megafauna Foundation, a non-profit organisation working towards worldwide protection of manta rays. We are e-mailed photos of people riding / touching / disturbing manta rays all the time, and I was forwarded a link to your website by a wonderful guest at one of my recent manta ray conservation talks. Please please please can you remove the photo of a diver riding a giant manta from your website. It is so sad to think that if we can’t get divers to respect manta rays then we’ve got a real fight on our hands to get the non-diving people of the world to respect these magnificent creatures. To have such a photo on your website only encourages that sort of awful diver behaviour. Comment on Disgstusting Picture ! I find the behaviour shown on the Travel picture absolutely disgusting. Manta rays just as any other intelligent lifeform on this planet don´t like to be touched or ridden. What would you think if I came up to you and just jump on your back to have you carry me around? Exactly this kind of misbehaviour has already led to whole Manta populations leaving areas where they once were abundant, so responsible divers have no chance of watching these beautiful animals in their environment anymore. So please help everybody to have a better experience by not promoting the misbehaviour of touching anything under water, but instead leave those animals alone so future generations can enjoy diving with these magnificent species too. Thank you. This is sad, I respect sea life, I wish everyone did, like libby and m.momberg, they have deep respect, please take down this photo. It’s not a horse, please don’t let people think it’s safe to try this, they do have a barb, and a large one at that. This picture says more than a thousand words about what a rubbish travel agent, or whatever the hell it is, you are. It is my sincere hope that this picture will make people choose a different organization. Enjoying the wilderness should be motivated by respect towards the beauty it delivers, a sentiment clearly alien to you. Really you think riding a manta ray is acceptable behaviour? I wouldn’t use your services if you were the last travel agent left. Others have said it better. Comment on What is wrong with you? 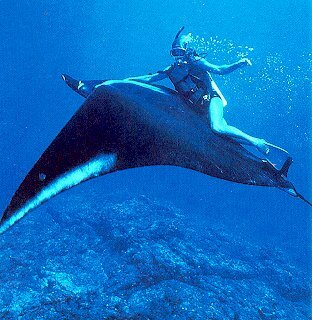 Why on earth would you think it is ok to ride a manta ray??!! Don’t you have any respect for the inhabitants of the wonderful ocean world? Are you seriously that clueless? It is attitudes such as yours, self centered and ignorant, that has gotten this planet into the sad state it is in. I hope someone decides to strap a 200 pound fish to your back and forces you to carry it around for a year. Can only echo the above comments. Horrible behavior.